At Master Spas, we want our customers to spend the majority of their time enjoying the many benefits of their hot tub, not worrying about the quality of their water. Few things are more disappointing to a hot tub owner than getting suited up and ready to take a restorative soak, only to discover that the water is dirty and murky. Fortunately, this scenario is entirely avoidable. A high-quality purification system can help you achieve crystal clear water with less maintenance and fewer spa chemicals. Master Spas’ exclusive EcoPur® Charge is revolutionizing water purification, doing it the way that Mother Nature intended. Making sure your water is clean ensures that your hot tub delivers optimum health and relaxation benefits. The water purification process usually necessitates the use of harsh chemicals or salt. These chemicals, and even salt, may have an impact on your skin and swimwear, as well as cause damage to your hot tub’s plumbing by acting as a corrosive agent over time. While there’s currently no option for a chemical-free hot tub, Master Spas’ innovative, patent-pending EcoPur® Charge significantly reduces the need for harsh chemicals to maintain water quality. Hot tubs tend to be an ideal breeding ground for bacteria, fungus and algae due to warmth, moisture and the organic matter that we leave behind as we soak, such as sunscreen and hair. 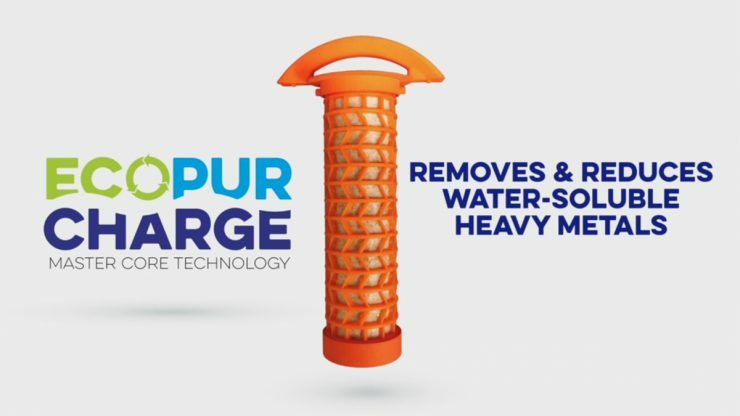 EcoPur® Charge is designed to remove these contaminants from the water. Through the use of tightly wrapped filtration fabric, which is loaded into a spring core, the water flows through the filter, causing a chemical reaction that releases controlled amounts of zinc and copper into the water. Copper and zinc create an environment where the algae, fungus and bacteria cannot thrive, thus safely and naturally eliminating these elements from the water. This process mimics the way water is filtered in nature, meaning less money is spent on harsh chemicals, and more time is spent enjoying your hot tub. Because EcoPur® Charge is only available from Master Spas, customers have access to some of the most advanced water purification technology on the market. Additionally, Master Spas customers with an older purification model can upgrade their filtration system to EcoPur® Charge simply by contacting their Master Spas dealer. Your dealer will be able to best direct you on how to replace your current filter cartridge with EcoPur® Charge. Go to www.masterspas.com/pure-water to learn more and to find the Master Spas dealer nearest you.